If you are a busy parent like me, you probably don’t worry too much about yearly eye check up’s. Your child gets a screening at the Pediatricians office, and sometimes in school as well. We are thankful for these screening, as they are able to identify a lot of children who need more comprehensive care. 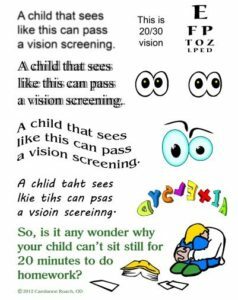 However, there are a lot of subtle vision conditions that screenings can miss. Most importantly – visual functions that help your child in school, and with their athletic performances. Every school aged child will benefit greatly from one yearly eye examination. 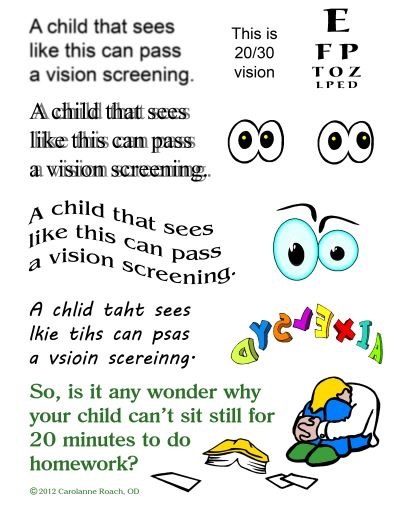 I bump this recommendation up to twice a year if I identify the child to be at high risk for progressive myopia, or needing further vision therapy. Don’t wait for a nudge from the Pediatrician or school nurse, or till your child complains. Make your child’s annual eye appointment today, and while you are at it make one for yourself too!